NW Local Selkirk Abbey Brewing Co.
Our beer and wine department has added some new additions, not only revamping the look of the section but also providing a new fill station that makes growler fills faster and more efficient! We would like to introduce the PEGAS CrafTap, a manual system that uses the same operating principle found in large beer bottling facilities around the world, the counter-pressure method. This method ensures that bottles are filled in the way that only automatic fillers can provide: no foam and at a rate of two liters in sixty seconds. 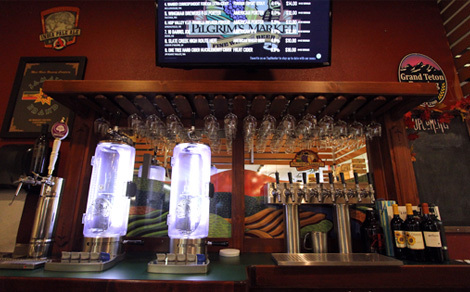 Pilgrim’s wines are personally selected by Certified Wine Specialist Sara Ray, and Pilgrim’s beer selection boasts over 350 varieties from all over the world, including Coeur d’Alene local and Northwest Micro-Brews, Imports and Organically produced beers and ales. At Pilgrim’s Beer and Wine Department, we look for quality, drinkability, price point and diversity. We also value small production, local producers, family owned and operated wineries, and the finest organic and gluten-free beer and wine available. Sara Ray, Pilgrim’s Beer and Wine Buyer, is a Certified Specialist of Wine (CSW) and spent three days in Oregon's Willamette Valley attending Oregon Pinot Camp and Workshops – a program that you must be chosen for out of hundreds of applicants.